RAMALLAH (Ma’an) — Israeli forces on Friday dispersed several demonstrations across the occupied West Bank, attacking Palestinian demonstrators with tear-gas grenades in numerous villages and causing dozens of injuries. Dozens of Palestinians suffered from excessive tear gas inhalation on Friday during the Bilin weekly protest against the separation wall and settlement construction. Demonstrators marched through the village of Bilin, raising Palestinian flags and chanting songs for unity and in solidarity with Palestinian prisoners in Israeli jails. When protestors reached village lands near the separation wall, Israeli forces fired tear-gas and stun grenades at demonstrators. Israeli soldiers chased protestors through the olive groves, causing Rafik al-Khatib and his family, who were picking olives nearby, to suffer tear-gas inhalation. Since 2005, Bilin villagers have protested on a weekly basis against the Israeli separation wall that runs through their village on land confiscated from local farmers. Previous protests by Bilin activists have forced the Israeli authorities to re-route the wall, but large chunks of the village lands are still inaccessible to residents. In Kafr Qaddum near Qalqiliya, meanwhile, Israeli forces dispersed demonstrators and subsequently declared the village a closed military zone. Protests are held every Friday in Kafr Qaddum against Israel’s closure of a main road linking the village to its nearest city, Nablus. Israeli forces also detained media crews including the crew of Palestine TV until the demonstration ended. They also prevented international activists from entering the village in solidarity with protestors. A spokeswoman from the Israeli army did not return calls Friday. The Palestinian city of Qalqiliya is almost completely surrounded by the Israeli separation wall, while checkpoints cut it off from most of the West Bank. Demonstrators voiced their support for the Palestinian Authority’s call to release a second batch of Palestinian prisoners who have been held in Israeli jails for over two decades. Protestors marched toward the gate that blocks the village’s main road and Israeli forces subsequently chased demonstrators and fired tear-gas and stun grenades to disperse them. Two Palestinians were also injured in clashes that broke out near Ofer prison in Beitunia west of Ramallah. 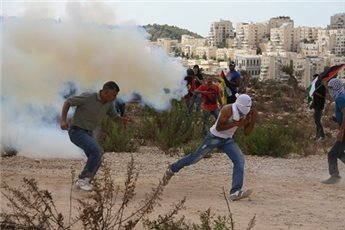 Three Israeli soldiers were also wounded in those clashes, which followed a Palestinian protest. Israeli forces fired live bullets, rubber bullets, and tear gas at protesters, injuring one with a live bullet and another with a rubber bullet. Three Israeli soldiers were lightly wounded after being hit by rocks thrown by protestors. Israeli forces chased protesters into the village, launching tear-gas grenades into Palestinian homes and neighborhoods. Israeli forces also dispersed a demonstration in al-Masara near Bethlehem, and detained protestors including Munther Ameera, Lubna Bandak, Jamil Barghouthi, and four international activists. Demonstrators there marched toward Israel’s wall, raising Palestinian flags in solidarity with the Al-Aqsa mosque in East Jerusalem. The Al-Aqsa Mosque sits atop a site considered holy for Muslims as well as Jews. It is in East Jerusalem, part of the internationally recognized Palestinian territories, but has been under Israeli occupation since 1967. “I am amazed that the international community watches the Palestinian identity, civility, economics and literature being assassinated each and every day and yet they do nothing,” Brejia added.